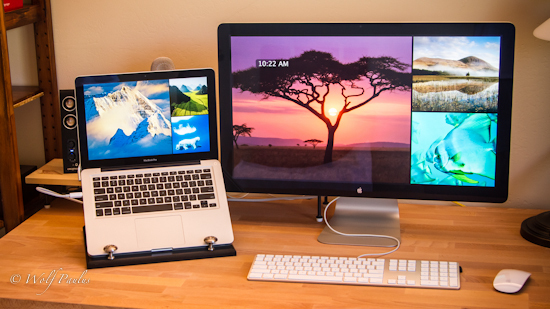 When we envisioned the new stand for MacBook, we landed on a remarkably elegant and stable design. But it’s nearly impossible to make a device so stylish and so firm, without sacrificing features or beauty. We could have taken the easy way out and designed something more reasonable and less remarkable. But we didn’t. If the technology didn’t exist, we invented it. If a component wasn’t solid enough, we re-imagined it. If convention was standing in the way, we left it behind. 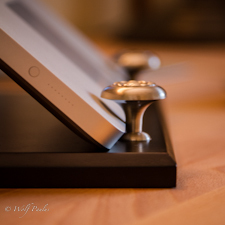 The result is iLift: the most elegant, most stable, most stunning MacBook Stand ever. We care deeply about ergonomics and comfort; iLift is 330 millimeters wide, 260 millimeters deep, and 90 millimeters high. To make that happen, Techcasita Productions’ engineers had to be creative. 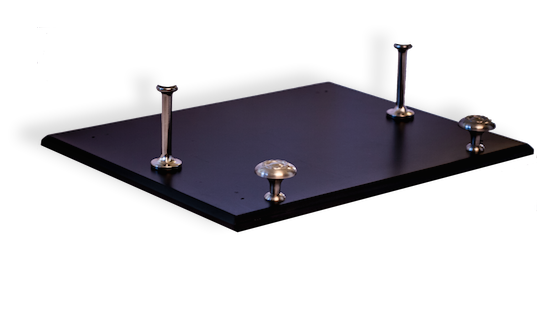 The conventional approach to building Laptop stands raises the complete laptop, decreases its footprint, thereby creating a wobbly, unstable structure. iLift raises the MacBook’s screen an unprecedented 165 millimeters (6.5-inches), which puts it right in the middle of Apple 27″ Thunderbolt Display – yet it’s 20 percent more stable and creates 22 percent more desk-space than any stand we have seen before. Making a more stable, more elegant, higher lifting MacBook Stand didn’t mean the stand had to be higher. Techcasita Productions’ engineers reduced and reduced in a design process that revolved around intense iteration and in the end accomplished that by creating the first stand built with only the two ultimate materials: wood and metal. Which means instead of brittle acrylic or ultra light aluminum, we used heavy duty rigid components that are beautiful at the same time. You experience more stability than ever before. 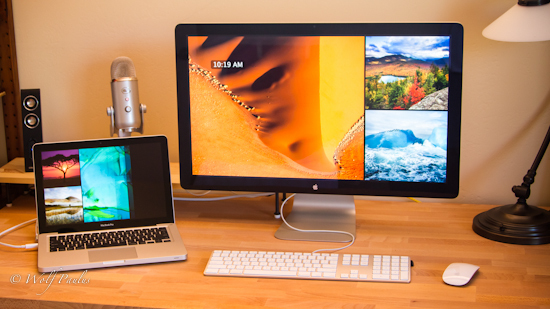 All with a stand that uses down to 22 percent less desk-space. 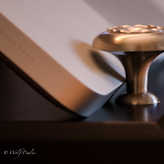 Two Satin Nickel Rope Knobs are used to securely hold MacBook in position. The knobs have beveled edges and beautiful sheen, setting the standard for fashion, finish and design innovation. 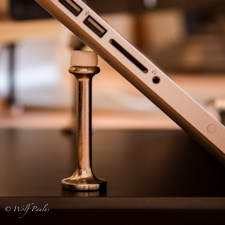 Two Satin Nickel Extensions with replaceable rubber tips are used to lift MacBook. The intelligent design of iLift makes it possible to raises the MacBook’s screen by 6.5-inches, while only deploying relatively short 3-inches long extensions. 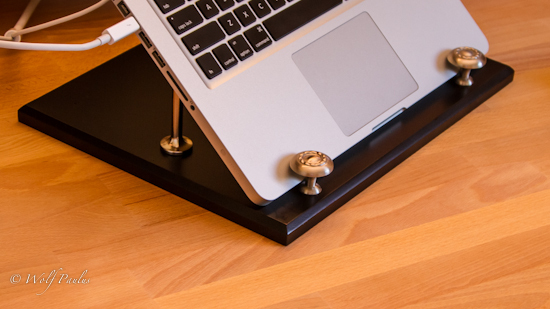 Never before has this degree of fit and finish been applied to a laptop stand. Take the Satin Nickel Rope Knobs at the front of iLift, for instance. During manufacturing, two of the premium quality “Inspirations” line 1.25-inches diameter, 1.8125-inches projection knobs are set exactly 50 millimeter in from the exterior edges of iLift. An engineers then examines the knobs and installs the 3-inches Satin Nickel Extensions. It’s what gives iLift its distinctive look. Fitting for a MacBook Stand so brilliant.